Hitwise released its latest April report and (surprise) Google has again hit a new high with 67.9% of all searches. Yahoo is second with 20.3% and Microsoft is far behind with only 6.3%. 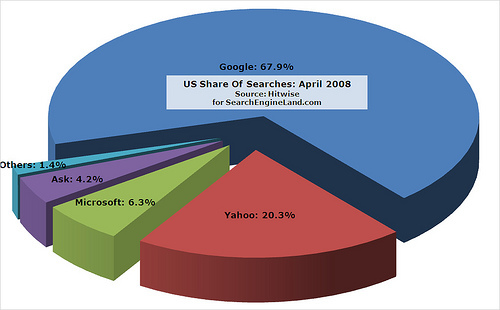 Patricia Hursh wrote a good blog entry at SearchEngineLand.com about online registrations and downloadable asssets. Online efforts are designed to generate leads and a good way to generate those leads is to give an incentive to people to enter their contact information. Most of the time, the incentive will be a downloadable eBook, or white paper, or report; call it whatever you want. bundle information – you may want to mix what you’re offering. It can be a white paper plus the recording of a webinar. Or a report with a podcast. By doing so, you create a much higher perceived value. offer multiple media formats – you want to leave people the choice to either read, watch, or listen. Various formats can be, video clip, podcast, webcast, product demo or a simple text document. A few weeks after being sued by eBay, CraigsList is now suing the auction giant, alleging eBay had used its minority stake in Craigslist to steal corporate trade secrets. Craigslist’s complaint alleges a plan by eBay to use its position as a minority shareholder in Craigslist and its position on the Craigslist board to gather competitive information that led to the launch of eBay’s rival classifieds business. The suit claims eBay code-named Kijiji its “Craigslist killer” in internal strategy discussions. MySpace has missed its financial targets, showing that social networking is struggling to earn its keep – even as part of Rupert Murdoch’s globe-spanning media empire. News Corp said yesterday that the site will fall short of its annual revenue target of $1bn by 10 per cent. Third quarter revenues actually fell to $210m from $233m in the preceding three months. About a third of MySpace revenues come from a guaranteed three year deal with Google, signed in 2006. The search giant has already started complaining that it’s not seeing a decent return on its end of the tie-up, however. What News Corp has in MySpace is an endless supply of page impressions. Despite the magical life-affirming properties of social networking, the laws of supply and demand still apply, and so those pages are worth little more to advertisers than the web’s bottomless midden of spam blogs. LiveSide took a look today at all the different bits of Microsoft’s Live.com search universe and found that it doesn’t provide a common, unified experience. LiveSide found four different search boxes, two different Live.com “orb” logos (in four different sizes), and six different header backgrounds. While the slight differences in design may not be a very substantial issue, it is indicative of the confusion Microsoft has created around their Live brand. MSN Hotmail vs. Windows Live Mail vs. Windows Live Hotmail…. Many names for the same service. It seems they have settled on Windows Live Hotmail, but there is still a lot of overlap in the Windows Live family that makes it confusing for consumers. The design differences across the Live Search sites highlighted today on the LiveSide blog may be minor, but taken as a whole they’re a good metaphor for the branding confusion that Microsoft has created across its collection of online sites and services. In the past seven years, Papa John’s has made a lot of dough from online ordering — more than $1 billion to be exact. Other chains in the fiercely competitive pizza industry are tapping into the technology craze to give customers ways to order pies other than through the standard phone call or trip to a restaurant. Dominos Pizza put its own twist on online ordering early this year by introducing a “Pizza Tracker,” which lets customers keep tabs on the progress of their orders. Consumers can find out when their pies are in the oven, when they’re on the way, and even the first name of their delivery person. Pizza Hut, the nation’s biggest pizza chain, also allows customers to order via text messaging and mobile Web. The unit of Yum Brands Inc. soon will unveil a new method for ordering pizzas, dubbed “Pizza Hut Shortcut,” that it says will be the fastest in the industry. Customers will be able to download a “widget” onto their computers that will let them place their favorite pizza orders with just one click. Microsoft gauged Facebook’s interest in a possible acquisition after the software giant’s failed takeover attempt of Yahoo, the Wall Street Journal reported today. The newspaper reported on its Web site that Microsoft’s bankers put out subtle signals to Facebook, the social networking Web site, to see if it would be open to a full acquisition. Microsoft Chairman Bill Gates said Wednesday the company isn’t pursuing other deals following the withdrawal of its $47.5 billion takeover bid for Yahoo. Microsoft’s intense pursuit of Yahoo was widely seen as an acknowledgment of weaknesses in Microsoft’s solo Web search and advertising strategy, and the software maker now needs to prove it can innovate without Yahoo as a partner. Possible partners for Microsoft in the future might include large Internet companies such as Time Warner Inc.’s AOL and News Corp.’s MySpace and promising startups such as Facebook Inc. (Microsoft already owns a 1.6 percent stake in Facebook) and LinkedIn Corp. Spend a lot of time on the headline. It may be your only chance to sell the news to your audience. The subhead/summary should enhance the headline. The body should answer who/what/where/when/why. Include 2-3 quotations from principals. The media and bloggers are attracted to these. Use a journalistic voice (just the facts). Don’t sell—this isn’t an advertisement. Know which keywords and phrases you want the press release to rank for, and only focus on 2 or 3 keywords/phrases per release. Use the keywords in the headline, subheader, and early in the body of the release. Link back to the relevant pages in your site using the keywords as anchor text.